Dining review • The hot and sour soup, marinated and grilled meats, and egg rolls shine at the West Jordan restaurant that puts the diner in the driver’s seat. (Francisco Kjolseth | The Salt Lake Tribune) Kayle Sumida, owner of Yeah Hot Pot & Grill in West Jordan assembles a hot and sour soup with white fish, noodles, mushrooms and bok choy. (Francisco Kjolseth | The Salt Lake Tribune) Soi Lam enjoys a recent lunch at Yeah Hot Pot & Grill in West Jordan as a steaming hot pot of soup boils in the foreground. (Francisco Kjolseth | The Salt Lake Tribune) Soi Lam, left, and Morris Douangbupha enjoy a recent lunch at Yeah Hot Pot & Grill in West Jordan. The Vietnamese BBQ restaurant has customers pick their ingredients from a coolers with color coded plates to add to a broth or hot grill. (Francisco Kjolseth | The Salt Lake Tribune) Morris Douangbupha serves himself a hot bowl of soup at Yeah Hot Pot & Grill in West Jordan. Customers choose their ingredients to add to different broth options as they customize the flavors to their taste. (Francisco Kjolseth | The Salt Lake Tribune) Owner Kayle Sumida of Yeah Hot Pot & Grill in West Jordan overlooks the ingredients available for patrons to choose from that are cooked at each table. (Francisco Kjolseth | The Salt Lake Tribune) Yeah Hot Pot & Grill in West Jordan features coolers labeled for each cooking platform and color coded dishes for staff to calculate your final bill. 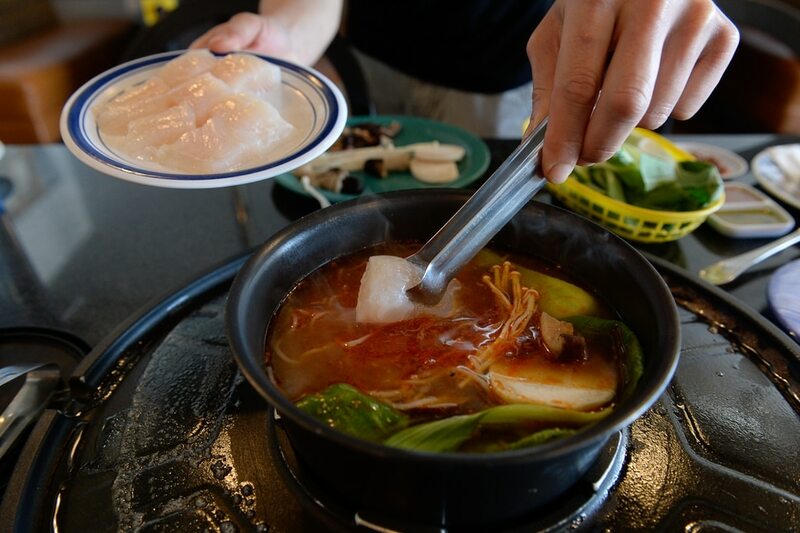 (Francisco Kjolseth | The Salt Lake Tribune) At Yeah Hot Pot & Grill in West Jordan customers dictate the cooking and assembling of their food starting off with melted butter and a broth to start off the direction of their soup. (Francisco Kjolseth | The Salt Lake Tribune) Kayle Sumida, owner of Yeah Hot Pot & Grill in West Jordan assembles a hot and sour soup with white fish, noodles, mushrooms and bok choy. (Francisco Kjolseth | The Salt Lake Tribune) Soi Lam enjoys a recent lunch at Yeah Hot Pot & Grill in West Jordan as a steaming hot pot of soup boils in the foreground. (Francisco Kjolseth | The Salt Lake Tribune) Yeah Hot Pot & Grill in West Jordan features coolers labeled for each cooking platform and color coded dishes for staff to calculate your final bill. (Francisco Kjolseth | The Salt Lake Tribune) Patrons of Yeah Hot Pot & Grill in West Jordan add ingredients including fish, shrimp and lobster soup balls to their broth along with meats to their grill during a recent lunch. (Francisco Kjolseth | The Salt Lake Tribune) Egg rolls are freshly fried at Yeah Hot Pot & Grill in West Jordan. 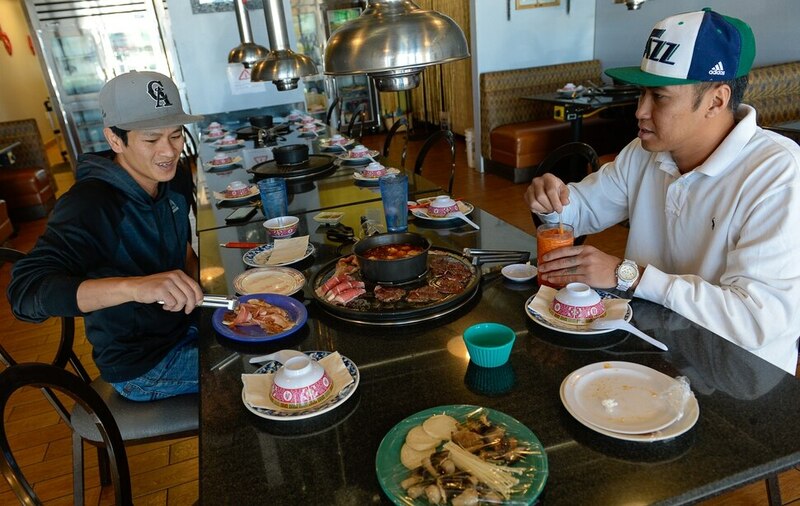 (Francisco Kjolseth | The Salt Lake Tribune) Yeah Hot Pot & Grill in West Jordan has coolers labeled for each cooking platform as customers pick the ingredients they want to cook at personalized grills at each table. 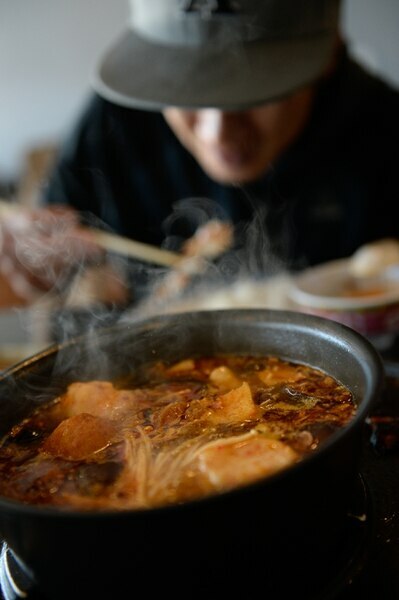 (Francisco Kjolseth | The Salt Lake Tribune) At Yeah Hot Pot & Grill in West Jordan customers control the heat as they cook soup and raw ingredients to their liking. (Francisco Kjolseth | The Salt Lake Tribune) Yeah Hot Pot & Grill in West Jordan lets patrons customize their soup to their liking by providing the ingredients in large coolers. (Francisco Kjolseth | The Salt Lake Tribune) Kayle Sumida, owner of Yeah Hot Pot & Grill in West Jordan lays out pork belly on a hot buttered grill during a recent lunch visit. (Francisco Kjolseth | The Salt Lake Tribune) Yeah Hot Pot & Grill in West Jordan features coolers labeled for each cooking platform and color coded dishes for staff to calculate your final bill. West Jordan • Don’t play with your food. Remember that saying? Now, forget you ever heard it. At Yeah Hot Pot & Grill, you’ll definitely want to play with your food — and here, it’s even encouraged. If you’ve never been to a hot pot or Korean barbecue-type grill, don’t stress, the servers will explain everything — from which refrigerated glass case contains ingredients for the hot pot, the grill or both, to how to use the many tools on your table and the pricing (per plate or bowl). It’s not quite a full-service restaurant — you are the one cooking, after all — so don’t be afraid to ask questions. Take the quail egg: I asked whether it was cooked, but not how it had been cooked, so I was unaware the yolk was soft-boiled until I bit into it. Just keep in mind that it’s supposed to be a fun, shared experience, and you’ll be good. For a warm, comforting meal perfect for these fall days, start with the hot pot. The server will bring pork broth (or vegan by request) to which you can add one of two flavors: garlic-onion or, my preference, hot and sour ($4.99 each with unlimited refills). Billed as mild-medium spicy, the hot and sour soup — or tom yum — gets all its punch from a red, aromatic paste that infuses the broth with ground herbs and spices. Other than a few surprise spoonfuls that sometimes collected all the heat from the spices, I found it neither too hot nor too sour but the perfect vehicle for the various meats and vegetables. For those more sensitive to spice, the garlic-onion broth offers a subtle flavor that won’t offend anyone — although it’s not likely to excite anyone, either. All the flavor comes from the fried bits of onion and garlic that can get lost among the other ingredients and sink to the bottom of the pot. The more difficult choice will be deciding which vegetables and proteins to cook in it — just remember to stick to the first cooler, which has the ideal types of meat for the hot pot. I made the mistake of grilling the round beef ($4.75) my first time there. Its texture — quite tough and chewy off the grill — was much improved in the broth. Although it’s not a protein I would select again for the soup. Seafood really shines in the hot pot, especially the white fish ($3.75) that perfectly poached into tender, delicate mouthfuls in the hot broth. Shrimp ($5.50) and crab ($8.25), the latter of which went into the soup shell-on and was added back in after removing the shell, held up just as well. Other options include chicken ($3.75) and pork ($4.50), as well as tofu ($1.50) and the aforementioned quail eggs ($1.75). Add in glass, rice or egg noodles (each $1) — all good choices — and vegetables, and you create a balanced, yet filling soup. I particularly enjoyed the choy sum ($2) and mushrooms ($4.50), which bring some earthiness to the dish. Like the soup, Yeah’s kimchi ($1.50) is neither too spicy nor too sour, a middle ground that I enjoyed but others might consider somewhat dumbed down for American tastes. Other offerings include baby corn ($1), lotus root ($1.75), edamame ($1.50), zucchini ($1.50), seaweed ($1) and baby potatoes ($1). (Francisco Kjolseth | The Salt Lake Tribune) Kayle Sumida, owner of Yeah Hot Pot & Grill in West Jordan, assembles a hot and sour soup with white fish, noodles, mushrooms and bok choy. 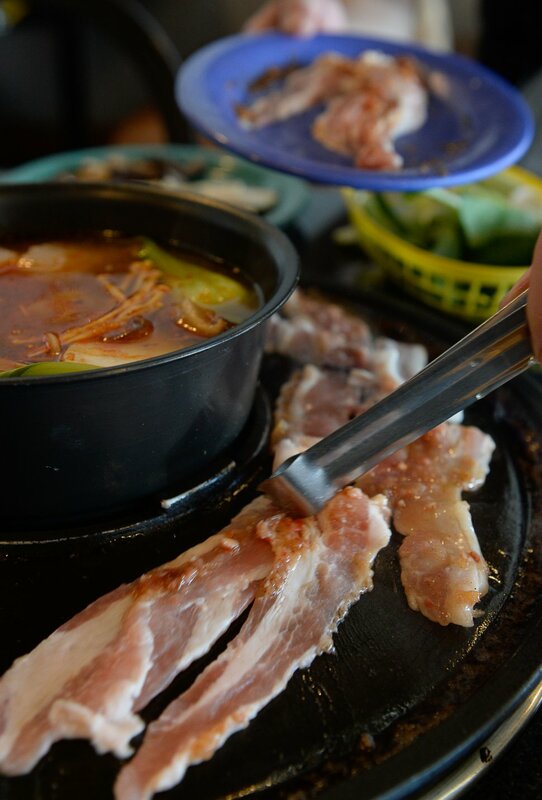 (Francisco Kjolseth | The Salt Lake Tribune) Kayle Sumida, owner of Yeah Hot Pot & Grill in West Jordan lays out pork belly on a hot buttered grill during a recent lunch visit. Your best bets here are any of the thinly sliced meats bathed in a sweet garlic sauce. Our server recommended the pork belly ($4.50), which easily became my favorite grill item. The marinade, which perfectly counters the fattiness of that particular cut, helps create crispy, sweet edges and a sticky but savory middle. Just as good were the chicken and shrimp (also marinated) with green beans, asparagus and broccoli ($3 together), and mushrooms ($4.50). And I really enjoyed the bacon-wrapped scallops ($3.75) dipped into the green-tinted, lime-infused sweet and sour sauce that comes on the side with a house sauce that’s similar to — but less sweet — than the marinade. Adding rice ($1) created a more complete and filling dish. A bit of a warning: The grill can get very, very hot — so much so that the butter and grease will splatter onto the table and sometimes the diner. If that happens, ask your server to turn it down a little. You cannot leave Yeah without ordering the egg rolls ($4.50). They are, hands down, some of the best I’ve had. 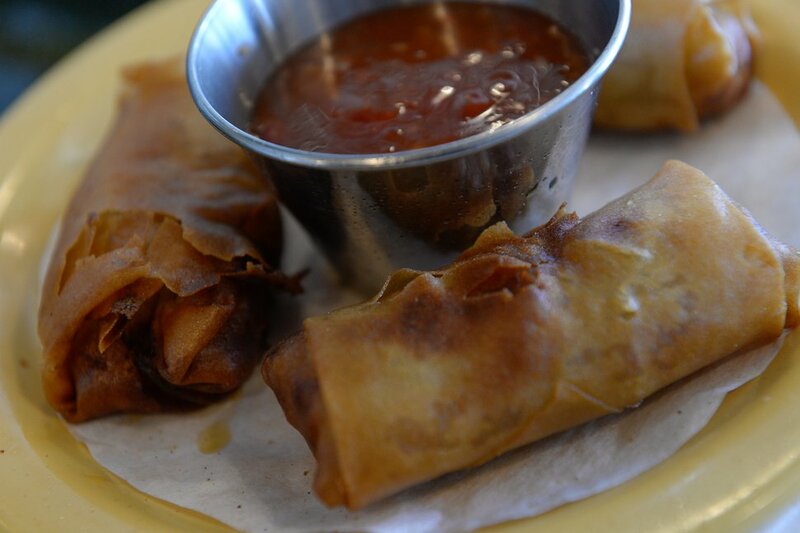 Much like Filipino lumpia, Yeah’s egg rolls are packed with pork and chicken or shrimp, with the cabbage and other vegetables enhancing the meat but taking a backseat. The savory, crisp appetizer pairs well with the house and sweet and sour sauces. Yeah also offers several prepared dishes that work well for carry-out orders, including a seafood soup ($7.99), vermicelli ($7.99) and jumbo chicken leg ($7.99). I sampled the pho meatball ($7.50) and rice plate ($7.99), both of which fell short of the high mark set by the hot pot and grill, despite featuring some of the same ingredients. My feelings are mixed about the pho meatball, which is based in a beef broth with green and white onions and rice noodles, and looks less like a meatball and more like a rolled sausage that had been cut into chunks. While the bean sprouts, lime and jalapeño added texture, brightness and a slight heat to the savory, somewhat greasy soup, the minty Thai basil felt at odds with the rest of the dish to the point that I found it no longer edible. Luckily, those items are presented separately, so you don’t have to use the basil. For those who’ve tried the grill, the rice plate will seem familiar as one option includes a marinated chicken (you also could get pork, beef or shrimp), as well as rice, lettuce, cucumber, pickled carrots and daikon, and a fried egg. Overall, it didn’t feel as flavorful as what we had prepared on the grill, and the egg was overcooked and fried on both sides. (Francisco Kjolseth | The Salt Lake Tribune) Egg rolls are freshly fried at Yeah Hot Pot & Grill in West Jordan. Where Yeah succeeds, however, it also stumbles — due entirely to inconsistency. Perhaps the most baffling: the egg rolls. In one batch, two came with a very meaty filling, which seems to be the standard, but the third was almost entirely made of vegetables — and no, Yeah does not make two kinds that could accidentally get mixed up. (Although if Yeah wanted to do an all-veggie egg roll, it likely would be the best in the valley.) Another round came out with nearly burned shells. But the most disappointing of all: On multiple plates, the marinade had been poured over the meat, leaving only the top slices to fully receive any flavor — a shame considering the sauce is where Yeah really succeeds. You can try to coat the meat in the remaining marinade, but you’re still not likely to taste much of it as the meat had no time to absorb any of that flavor and most of it will transfer to the grill when it is seared. Both those things can easily be remedied. And I hope they are, as the egg rolls and marinated meats are just two items that showcase the best of what Yeah offers — super flavorful food. In fact, both are so good you won’t want to share, but it’s more fun if you do. After all, it’s those moments with family or friends — laughing as you try and fail to ladle the noodles the first time (pro tip: cut them with scissors) or cringing over that soft-boiled quail egg — that really stand out and give life to the experience at Yeah Hot Pot & Grill. As its name implies, Yeah specializes in hot pot soups and marinated, Korean barbecue-like grilled meats and veggies. Although those preparations are the centerpiece of the restaurant’s 11 tables, Yeah also offers Vietnamese dishes like pho with meatballs or filet mignon. Must-tries include the egg rolls, the hot and sour broth with some seafood, and marinated pork belly on the grill. Fun fact: Yeah’s logo is an ambigram.